Slice the peaches and remove pits. There is no need to remove the peel. In a blender puree the peach slices, maple syrup (or honey), and water. Pour the mixture into frozen ice cream maker bowl and follow manufacturer instructions (in my case that meant letting it run for 15-20 minutes). Enjoy! Also, check out our recipe for Homemade Maple Pecan Ice Cream. Do you think this would work with strawberries and bananas? Did u find organic peaches? If so where? Yes! Earth Fare in Ballantyne has them (from S.C.)…get them while you can! We made pineapple/mango sorbet the other night that turned out DELICIOUS!!! (put in some fresh lime juice too)…so tasty! Try it! Ohhh I’m going to try this one too! Ok, I now have the same ice cream maker as you, definitely ready to not use all that ice and rock salt. :-) I also now have fresh peaches. I was just curious, would double this recipe fit in your ice cream maker or was it pretty full with the recipe as is? Thanks! If it isn’t too late I think a double recipe would fit. This looks delicious. Do you have to use an ice cream maker? Or is it possible to blend this like the banana ice cream? I really don’t have the money to put into an ice cream maker at this time, but I have plenty of frozen peaches and a couple of kids who LOVE ice cream! If your peaches are frozen it would be worth trying it in the blender (similar to the banana ice cream recipe)! Ok what do you use to freeze it. I made some last week and the leftover in the freezer turned into hard as a rock in my freezer safe bowl. I can’t even scoop it. Ironically I made the same thing with cherries earlier in the summer and it stayed scoopable. I also added some lemon juice too. When I freeze leftover homemade ice cream I freeze it in a container other than the ice cream bowl and let it sit on the counter to soften before we eat it. WOW. That is a great recipe. I was so excited I couldn’t wait so I stuck my spoon right in the ice cream maker….now I really can’t wait for dessert time! 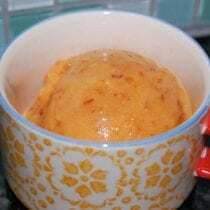 Just made the peach sorbet and it was great and made some strawberry too and it was outstanding! I don’t know if your familiar with the strawberry Dole bars but it tastes exactly like them–so good :-) I filled a couple of Popsicle molds just to have them for later with the little bit I had left over. To make the strawberry sorbet I purÃ©ed strawberries, water, and maple syrup just like the peach, put it in my ice cream maker, and in no time super goodness! About how many strawberries did you use to make the strawberry sorbet? I don’t like peaches, but I love strawberries! that is amazingly easy! can’t wait to unearth my ice-cream maker and give it a try. thanks for sharing. I made this the other night and loved it. I also tried it with Kiwi and it was a huge hit. Thanks for a great recipe. I made this the other day I used a food processor and it didn’t turn out so good. To chunky. Next time I will use very ripe peaches (or other fruit) So I can puree it in my blender. I to put the left over in the freezer in the ice cream freezer container now it is rock solid. Will not do that again. I liked the one post where they put there’s in popsicle molds. I’ll have to get me some molds. Once I try the sorbet again I’ll let you know how it turns out. Adding a couple of tablespoons of alcohol (vodka, schnapps,etc)will keep the mixture from becoming too hard in the freezer. So making this recipe soon! When we had the peach truck come through last week here in , I got a box. The kids helped me pit them, and i threw them into the blender (skin & all) to puree. Then we poured the puree into freezer containers, and put them in the freezer for later smoothies… and apparently for sorbet! Yummy! I used peaches I ‘d picked and frozen, mostly thawed and pureed. Perfect recipe, thank you! Does anyone know how to make this without a ice cream machine? It would probably work without an ice cream machine if you used frozen peaches. Can you make this using blueberries or strawberries? if yes, how many cups of fruit would I use? Hi Leila. I’ve made this with raspberries and did not change any measurements. How many cups of berries did you use? Hi again. Sorry. :) I’d say about 1-1 1/2 packed cups. You can add more if the consistency is not what you’d like. so you use 4 raspberries??? How many cupws of raspberries do you use? I mentioned above 1-1.5 cups packed. How many strawberries would you need to use? This might be the best thing that ever happened to me. I’ve made it several times and even the teenager enjoyed it. Thanks Real Food team! Wow that was amazing! I don’t really like peach skins, so I never buy them, but I love nectarines, so I made this with them and it turned out so yummy! My kids loved it. My son has dairy allergies and getting ice cream for him is so expensive and I never get around to making it for him. This was so easy. He said, “This is the best sorbet ever!” We will definitely making more soon! Thank you! I just tried this recipe but substituted 1.5 cups of frozen strawberries. It was pretty cold so I skipped putting it in the ice cream maker. So good. Thanks for the recipe. Is it possible to make this without an icecream maker? Without scrolling through all the comments… Can you tell me what ice cream maker was used? I have looked on Amazon and tried to compare and got so frustrated I decided to stop even looking! Can you tell me what type of Ice Cream maker you used? The traditional one with adding ice and salt or did you use something different? I would like one that isn’t so messy. This was delicious! So yummy and refreshing, and I love that I didn’t need to peel the peaches first. Definitely a keeper! I made this last night, and today it’s way too hard! I did some research, and it seems that if you add less sugar, your sorbet comes out less scoop-able. I’m surprised that nobody who made this recipe mentioned that..